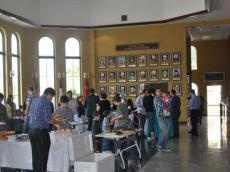 Last week, Azerbaijani American Cultural Alliance (AACA) held an event to mark the Solidarity Day of World Azerbaijanis. The reception started with the speech of the member of the organization and teacher at the Azerbaijani School of Houston, Mirgelem Miriyev who welcomed the guests and spoke of the importance of the occasion. The participants of the event then held a minute of silence to commemorate Parviz Soltanov, a thirty-year old PhD student who studied at the Texas Tech University in Lubbock, Texas and passed away in Baku on December 13 after a long illness. The attendants also paid tribute to the victims of the Sandy Hook Elementary School Massacre which took place on December 14. The program continued with the national anthem of Azerbaijan, performed by the children from the Azerbaijani school in Houston, founded by AACA. The children then read the famous poem “Azerbaijan” by renowned Azerbaijani poet Samed Vurgun. The event continued with Azerbaijani kids’ performance of two theatrical acts of "Yeddi nar çubugu" (Seven pomegranate sticks) and "Turp nagili" (Fable about the turnip), conveying the message of unity and solidarity. The last part of the program included the exhibition of works by Azerbaijani children and artist Parvina Aliyeva who lives in Houston and teaches at the Azerbaijani School of Houston. The event was attended by more than hundred guests from various cities of Texas. The spectacle performed by Azerbaijani kids was the first theatrical project initiated by the Azerbaijani School in Houston. The authors of the initiative, the director of Azerbaijani American Cultural Alliance, Ismayil Ahmedov, Namig Khochberov and Eldeniz Mirzayev will continue the school program and extracurricular activities in the next semester.